Beulah was born October 24, 1917 in Tampico, IL the daughter of Frank and May (Brady) Peterson. She married Wilbert Gentz on August 30, 1940 in Moline. He preceded her in death on July 12, 2004. 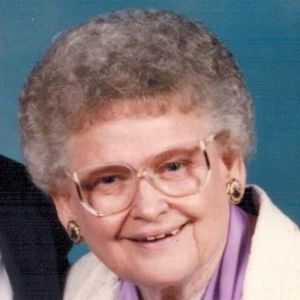 Beulah worked at Berman Electric in Moline, but most of all she was a farmer's wife. Beulah was passionate about her faith in the Lord and taught Sunday school for many years. She enjoyed all domestic activates and had the gift of hospitality. Beulah attended Harvest Time Bible Church in Rock Falls, and Tampico Baptist Church in Tampico. Survivors include her daughter Sharon Moss of Downers Grove, two grandchildren Pam Moss and Deanna Lambert, and two great grandchildren Brook and Courtney Lambert. A visitation will be from 10:00-11:00AM Friday, September 4, 2015 at the Tampico Baptist Church in Tampico. The funeral service will be at 11:00AM Friday at the church with Reverend Karl Kaiser and Reverend Dalmus Meeks Co-officiating. Burial will follow at Riverside Cemetery in Prophetstown. A memorial has been established to Harvest Time Bible Church, Tampico Baptist Church or the charity of your choice.